I have to admit, since the arrival of my new Bow Builder Punch, I've been a little addicted (oops), with my family finding bows all over the place! Because of this, I simply had to add a bow to one of my latest creations, and here it is! 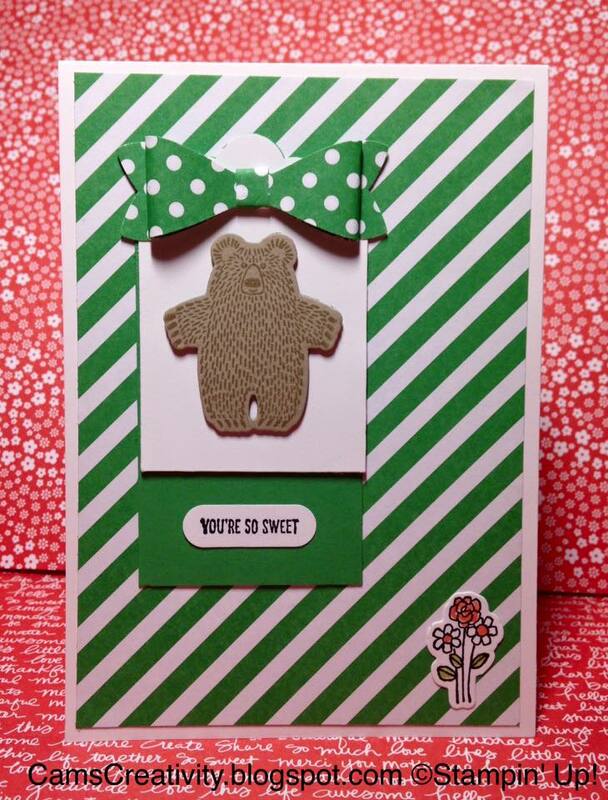 Made using the Bear Hugs stamp set from the Spring/Summer catalogue, and some of our Cucumber Crush, I think the spotty bow sets off the stripes really nicely! The baby bear was stamped onto some Crumb Cake card, using the Crumb Cake Stampin' Pad, and the flowers using Basic Black Archival Stampin' Pad, coloured in with Calypso Coral Stampin' Write Marker and the Cucumber Crush Stampin' Pad and Aqua Painter. The tag was made from Cucumber Crush and Whisper White card, cut to 2" wide (5cm) x 4" and 3" long (10cm and 7.5cm), punched with the Scalloped Tag Topper Punch. 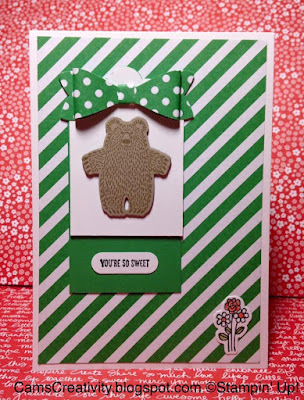 The greeting was punched using the Word Window Punch, and the background and the bow were made from Cucumber Crush Designer Series Paper (part of the In Color 2015-17 DSP Stack).